The Butterknife of Justice was designed for largemouth bass. I have always had an interest in fishing for largemouth bass and even since I began fly fishing, I have never lost that interest. I just use flies now instead of lures. 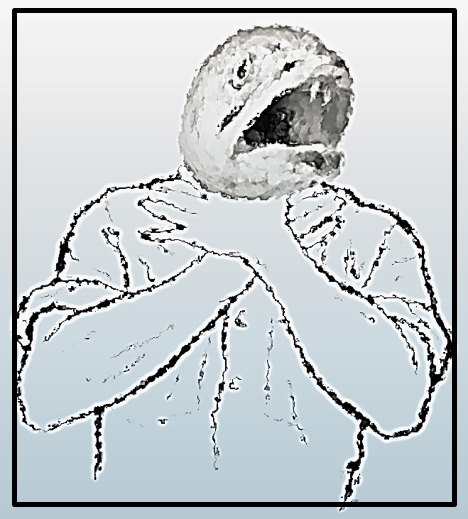 This is the reason I founded the Bucket Mouth League, a loosely based organization that promotes catching largemouth bass on the fly. To me this is all about fun. Isn’t that what fly fishing is all about? What is great, is that I can design and tie large articulated flies and use them to catch largemouth bass. However, the size of the Butterknife of Justice is the same size as many of the articulated streamers that you might have heard of that are used for large brown trout as well. Even though I haven’t tested it on brown trout yet, I am positive it will be very effective at catching them as well because the profile and action. 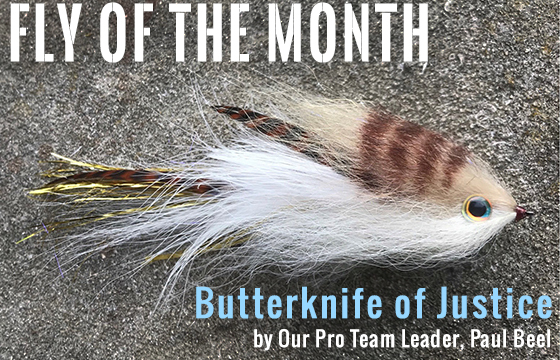 This entry was posted in Fly of the Month, Fly Tying Materials & Supplies, J. Stockard Pro Tyers, Our Regular Contributors, Paul Beel, Frankenfly and tagged fly fishing, fly of the month, fly tying, fly tying materials on May 30, 2018 by Paul J. Beel. Tucked away in the foothills of the Cantabrian Mountains in northern Spain is the provincial town of León, Spain. Not large by any standard, at approximately 130,000 people, Leon isn’t on many radars outside of Spain. However, for the fly tier, the Leon region is the origin of one of fly tying’s most ancient and versatile materials—the Coq de Leon hackle. Gallos de Leon as they are called in Spanish (why the French spelling–Coq de Leon– is preferred outside Spain is unknown) are reared in the Curueño Valley along the Curueño river. The villages of La Candana de Curueño and La Vecilla are the origin of this rare breed. 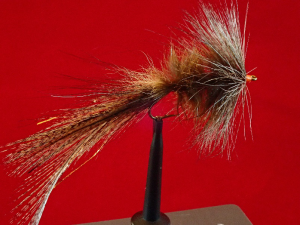 This entry was posted in Fly Tying Materials & Supplies, Mike Cline, Bozeman MT, Our Regular Contributors and tagged Coq de Leon, feathers, fly fishing, fly tying, fly tying materials on May 23, 2018 by Mike Cline. Ever hear those ubiquitous analogies about trout fatigue, such as “a hooked fish fighting your rod exerts more energy than a human doing three sets of heavy squats followed by five consecutive 100-yard dashes”? Every wonder from whence those exaggerations come…how much empirical calculation goes into them…how accurate they really are? Spoiler: They’re not calculated. They’re more what you’d call a colorful explanation. They’re trying to make an impression. But…what’s the real science behind such claims? This entry was posted in Fly Fishing Life, Michael Vorhis, Fly Fisher & Author, Our Regular Contributors and tagged fly fishing, fly fishing life on May 17, 2018 by Michael Vorhis.